Not quite sure what to buy?? Our most versatile tool is a great place to start. Don't let it's small size fool you, the Small Block is an amazingly powerful and effective Trigger Point Tool. Small enough to fit in your pants pocket; it can be taken with you anywhere. 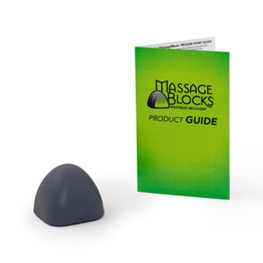 This tool has limited stand off and is best for the parts of your body that can be easily pressed into the floor or wall. This purchase includes a Small Knot Finder only.